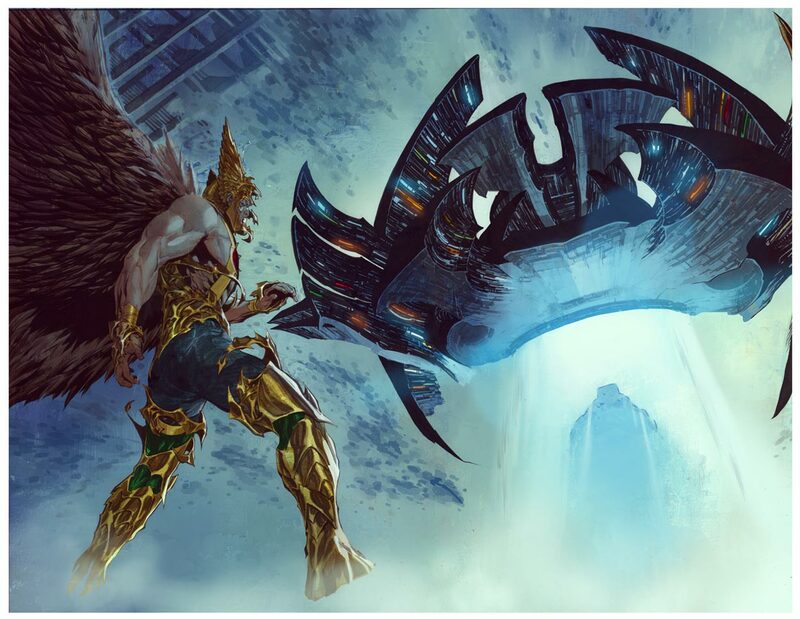 Artist Philip Tan sat down with the good folks at Newsarama to talk about The Savage Hawkman, complete with some exceptional artwork! Check it out! Image: Savage Hawkman interiors, 2011, Philip Tan. The Savage Hawkman #2 is in stores today! Hawkman was in a bad way at the end of the last issue, seemingly drained of his life force by the mysterious alien creature Morphicius. But the Winged Wonder has never been one to back down from a challenge, and with his strange new Nth-metal derived powers, I'm willing to bet that the Savage Hawkman will come back swinging! 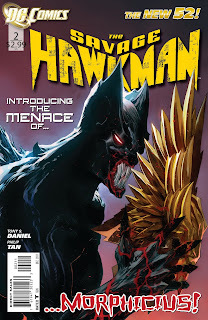 Tony Daniel and Philip Tan continue their new direction for Hawkman and you can see it all today! 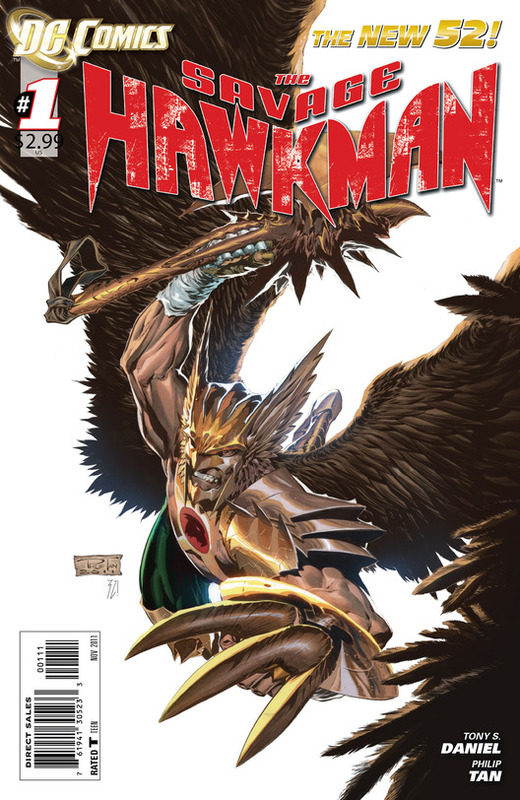 Pick up your copy of Savage Hawkman #2 in your LCS today! Or, if you are like me, start fretting angrily as you wait for your mail order box to ship! Image: The Savage Hawkman #2, 2011, Philip Tan. Title: "The Headhunter Part 2: Taking Off The Mask"
Summary: Kendra is just finishing up the movie she and her date were seeing (Buster Keaton's The Cameraman) when she sees emergency vehicles speeding towards her apartment complex. She gives chase, while inside the apartment the Headhunter has Hawkman at his mercy. Ranting to himself about the ability of Hawkman's spirit to survive, Headhunter is about to decapitate our hero when Kendra bursts in. She lays into Headhunter, including burying a hatchet in his mask, but the mysterious villain throws a strange dust in the air and escapes. Kendra angrily demands to know why Hawkman is in her apartment, but he has no answers for her before he leaves, taking the Headhunter's Hawkman voodoo doll. Later, temporary Professor Carter Hall gets a phone call from Ray Palmer, who informs him that the dust used by the Headhunter is actually finely ground Nth Metal. The voodoo doll is covered with traces of embalming fluids and soil, which leads Ray and Carter to deduce that it had been in a graveyard recently. Inspecting one of St. Roch's above ground graveyards, Hawkman is ambushed by Headhunter once more. The masked foe throws Carter's rubbings of his former graves at him, claiming that he now controls all of Hawkman's past lives. Headhunter throws a series of bones into the earth, and the decayed forms of all of Carter's former lives rise up to kill him! Review: The danger level gets pumped up a notch in the middle chapter of the story, with things going from bad to worse for the Winged Wonder. I like the angst we get from Kendra as well, and cameos from the Atom are always welcome. I thought the close-quarters combat in Kendra's apartment was well handled and not overlong, but the best part of this issue (to me anyway) was tying the stand alone issues from earlier in the run with the present. Those single issue stories where Carter learned about his past lives were nice, but it made me happy to see that information used again, revealing them to be actual foreshadowing and not just filler. Strong installment with a great cliffhanger. At this point I don't think I can add anything more about Rags Morales on this series other than we get to see a bit more full body shots of the Headhunter and he certainly looks menacing. Something like a South Pacific tribal witch doctor mixed with a Caribbean voodoo priest. Watson's cover is super striking as well, with the blood and gore put to great use. Note: In light of the New 52 relaunch, Generation and Retcon Status are going to be getting new categories very soon. Keep watching this space to stay informed! Image: Hawkman v.4:no.21, 2004, John Watson. Thanks to io9, we have a sweet preview of The Savage Hawkman #2, which is due in stores on October 26. I have posted the cover but if you want the preview pages then click here and check it out! 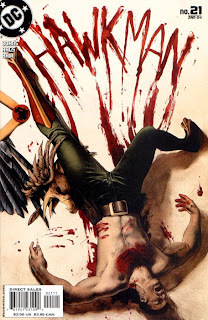 Image: The Savage Hawkman #2 cover, 2011, Philip Tan. Summary: Hawkman is on patrol when he spots a space ship crashing! Investigating, he finds a race of giants on board, along with a mysterious egg and a journal -- half in an alien language and half in English. He learns that the egg is the gestating infant of the giants, who are from Neptune. Carter takes the egg home to study it, but Shiera plays a prank on him by swiping it, and the egg eventually winds up in the hands of Noel Ratchford, who is also experimenting with growing things inside eggs. Eventually the egg hatches, and a Neptunian boy emerges. Noel begins to train the boy to be his tool for destruction, claiming to be Carter Hall so that the boy will commit acts of carnage in his name. Noel sends the boy on a killing spree, using the electrical fire-beams from his eyes and destroying buildings. Hawkman swoops in with a spear, blinding the giant in one eye and forcing him to take him to his master. Finding Noel, the giant boy tries to kill both of them, but Hawkman kills the alien and gets Noel arrested, clearing himself in the process. Review: There's some insane moments in this story, from the very concept of a giant baby hatching from an egg, to his eventual rampage through New York, including stomping a woman under his foot! It's like something from a daikaiju movie. Beyond that, this is a rather out-there science fiction story. The whole concept of a giant blue skinned alien from Neptune shooting electronic beams from his eyes is pretty darn awesome. Unfortunately the Noel plot takes up too much time and takes away a lot of panels from Hawkman fighting a giant humanoid alien. Hawkman gets to act fairly barbaric here, including spearing the alien in the eye, and then stabbing him in the back of the neck to kill him! Pretty fun short story all told. As usual, Moldoff gets in some glamorous panels of Shiera even if she is partly responsible for the Neptunian's appearance. Moldoff's cover is also one of the best I have seen so far in this series. 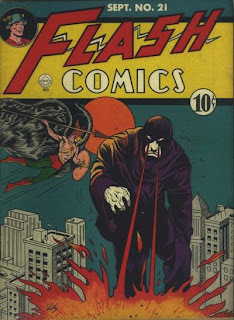 Image: Flash Comics #21, 1941, Sheldon Moldoff. 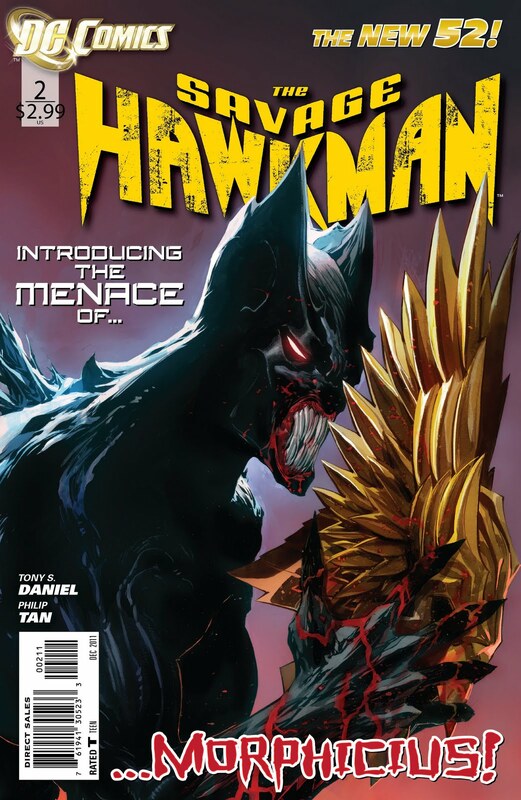 Thanks to The Source, we now have solicits for issue #5 of The Savage Hawkman! The appearance of an otherworldly visitor to the city sets in motion a series of horrifying visions of the dead walking the streets of New York City. But only Carter can see them, causing him to question his own sanity. Can Hawkman unravel the mystery before it consumes him? Hawkman fighting the living dead? How trendy! If I can speculate, it seems as if the Morphicius storyline will wrap up in #4, opening the door for this story. Although from the solicit, I suppose that this could be tied to that storyline as well. 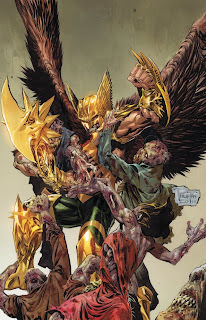 I really dig Tan's cover, with Hawkman battling a group of zombies. I think the Winged Wonder is about to open a can of whoopin'! Image: The Savage Hawkman #5, 2011, Philip Tan. [Tony] Daniel pointed out the "incredible job" Philip Tan is doing on the artwork. He said the core essence of the title is "action," "excitement," and "character development of Carter Hall." The art shown was from issue #3, and Daniel pointed out a new villain, and said he wanted to give him some formidable rogues. Unfortunately, Newsarama did not show the aforementioned artwork, but new villains are always welcome. I think that Daniel's statement about the title's core being action and excitement is a good fit for Hawkman, so hopefully we will get that kind of book as we go forward. Summary: An underwater archaeologist (wha... ?) off the coast of Crete discovers a set of wings made from wax and feathers, and determines them to be the wings worn by Icarus in the days of Ancient Greece! Midway City Museum press secretary Joe Tracy thinks the wings will be a perfect centerpiece to their fundraising activities for the new wing they want to build, and sets up a photo op where curator Carter Hall will fly with the wings. Carter is bemused by the idea, and makes sure to fly a little awkwardly so that no one will suspect that he is actually Hawkman. After the publicity stunt, Hawkman takes the wings to his spaceship to run tests on them to determine if they are in fact Icarus' wings. Back on Earth, Hawkman stumbles upon a truck robbery in progress. Giving pursuit, the Pinioned Palladin is able to disarm two of the thugs, but the third one, Eddie, shoots Hawkman with a strange bazooka like gun, destroying his wings and knocking the hero out. With his anti-gravity belt on full, Hawkman rapidly ascends into the atmosphere. Awoken just outside of low-Earth orbit, Hawkman makes his way back to the ship. There, he equips himself with the Icarus wings (proven to be so by the Thanagarian instruments) and an ancient Grecian battering ram. Returning to Earth, Hawkman makes quick work of the thieves, and has the Midway City PD donate the reward to the Museum, which helps fund the new wing. Review: Overall a very weak second story for this issue. Anderson's art is fine, but the story takes what should be a novel idea -- Hawkman using the mythological wings of Icarus -- and essentially squanders it. We never learn what exactly the weapon does, only one of the crooks even gets a name, and we don't get even get to see Hawkgirl! The lead story from this issue was not one of the best from this era, but it's head and shoulders better than this tale, unfortunately. I am sort of scratching my head over the Retcon Status of this issue. Some elements of this story seem to fit really well with the Earth-2 Hawkman (the wings of Icarus, a Grecian battering ram), while the reliance on Thanagarian technology and the Hawks' space ship make it a hard for a Generation change. 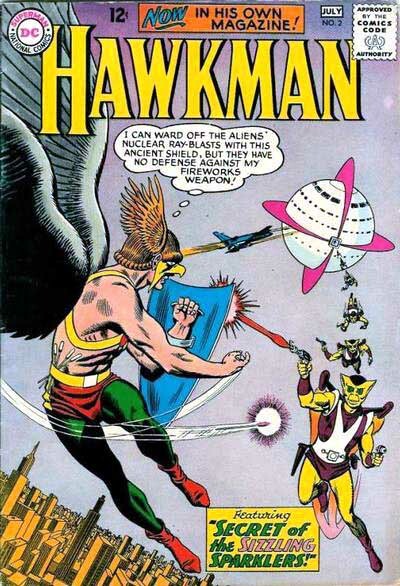 So while I suppose the Golden Age Hawks might have acquired a fully equipped Thanagarian space ship at some point, that doesn't really make a lot of sense to me. This is one of those stories which doesn't fit neatly into either category, which, considering it's quality, is not the end of the world. Image: Hawkman v.1:no.2, 1964, Murphy Anderson. 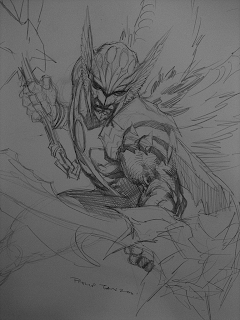 Savage Hawkman Sketch by Philip Tan! While I have heard some mixed reviews on Tony Daniel's story, so far everyone seems to dig Tan's artwork, myself included. And it's no surprise when he churns out pieces as swank as this one. Image: Hawkman Sketch, 2011, Philip Tan, image retrieved from Designosaurus. There has got to be a way to make this a poster! 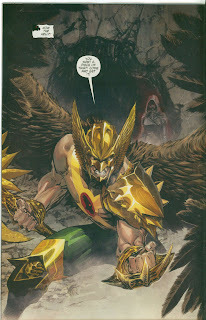 Image: Savage Hawkman revealed, The Savage Hawkman #1, 2011, Philip Tan. Carter then wakes back in his ill-kept brownstone, seemingly alright save for some burns on his hands and a broken window. He tries to figure out how he got home (while naked, even) when his coworker Terrence shows up. Professor Ziegler and his daughter Emma have found an alien shipwreck several hundred years older than the Titanic, and Carter is needed for the examination. Carter goes with Terrence, but not before noticing that his hands are now fully healed. At Ziegler's facility, the examination is under way. Inside the wreck, the Professor has found several pods, each containing an alien mummy! But as two of Ziegler's men examine one of the pods, they are attacked by an inky substance coming from inside the mummy. The men are quickly consumed and become slimy humanoid beasts. Carter gets everyone out and leaps to attack the creatures, thinking that this will be his last fight. But his skin begins to burble, and the Nth metal erupts from his skin, arming and armoring him as the hero Hawkman once again! Hawkman attacks the main creature, who calls himself Morphicius, and claims that he consumes and expends energy. The two warriors brawl back and forth with neither able to get the upper hand. Morphicius finds Hawkman's life force strangely resistant, but he begins to absorb his foe's life force, giving his alien form wings and golden armor, while Hawkman is a drained husk! Review: The Savage Hawkman is here! And it's a pretty powerful debut at that. In short order we are introduced to Carter Hall at his lowest, and then he is thrown in a strange new direction right as a new alien menace rears its head. Philip Tan's art is excellent. I thought his stuff on Outsiders was the cat's pajamas, and if anything this book looks better. The full page reveal of Hawkman's new gear is screaming to be a poster. I really dig the morphing weapon, which starts out as a short handled axe, and then becomes a morningstar. The spiked kneepads add a layer of welcome barbarism and even the shoulderpads work for me. The helmet is also suitably "savage." About the only thing which would have been really cool would be if the wings were metallic as well, but the feathered wings are so classic that it is hard to fault them. I really hope Tan can keep on deadline because his Hawkman is one I want to see. Now, what about Tony Daniel's story? Frankly, I liked it. After I read the issue, I wanted to read it again. Seeing Carter at the absolute bottom ties in so strongly with the end of Brightest Day that it seems that, in some way shape or form, that the Hawks' story still went down. And much like I said at the end of that book, a Hawkman without Hawkgirl to ground him is a dangerous individual. The idea of Carter working as a cryptologist is a twist on the classic museum curator/archaeologist riff, and it looks like Daniel is introducing a new supporting cast with some potential. I like the mysterious appearance of Morphicius and am very curious what his origin is. The little bit about "alien mummies" made me grin too. Plus its one heck of a cliffhanger! To me the most controversial aspect is the Nth metal becoming seemingly a part of Carter himself. It's very similar to how Iron Man's armor currently works, oddly enough. I think it's certainly going to streamline his powers since he doesn't have to "gear up" before heading out, and it opens the door to stories of just what the heck the Nth metal has done to him. This sort of approach is preferable to me than the sort of vague, "He's spent a lot of time around Nth metal" excuse for various odd happenings. So at first blush I am cool with it. Overall, I was very satisfied with this issue and am now champing at the bit for #2. This is a new Hawkman for a new universe, and hopefully this clean slate and new direction will be one which will last for a good long while! I also really marked out for the "Hawkman created by Gardner Fox" credit. Keep it up DC! Image: The Savage Hawkman, #1, 2011, Philip Tan. The Savage Hawkman #1 Incoming!